Lately, I've been really busy with work and a lot of other stuff at home and for the blog too, that I seriously didn't realize that Mother's Day is fast approaching, as in this Sunday, May 10 already! Unlike in the past years, when it's two weeks prior to the BIG day for moms, we could visibly see the preparation of establishments for it, and in the end, we as moms become so psyched up about our big day. But when I asked my Mommy friends as well as my Mommy readers, MOST of their answers is: SLEEP. Which is shown as 20% of the survey respondents's answer in this graphic. If I would have it my way, I would want a GOOOOOOOOOOOOOOOD Massage in a nice Spa and to be allowed to sleep at least an hour after the massage. Plus more sleep at night, I mean UNINTERRUPTED SLEEP that is. Seriously, if you'd notice in the graphic above, these are not material things. If you would translate the wishes of every moms, there are underlying emotions or aspirations which mom really want to achieve not only on Mother's Day, but for the rest of the year. 1. APPRECIATION. By this, a simple THANK YOU at the most unexpected time, while we're busy cleaning the house, cooking, organizing the toys, picking up clothes on the floor - goes a long way. It honestly melts our hearts. It takes away the weariness we physically feel, even the emotional struggles we're going through. And while you're at it, then this THANK YOU could come with our favorite brand of bag/shoes/wallet/jewels/shirt/collection piece/favorite anything. It could also come with a bouquet of flowers/chocolates/cake. An old-fashioned greeting card or lovingly written letter on any piece of paper never loses its charm. Oh, and don't forget to say how beautiful we are okay? Make that the MOST BEAUTIFUL! 2. PEACE. That clean house, the stillness of the night, kids playing together and not fighting over toys or gadgets or which show to watch on TV, husbands that agree to what you say, that's PEACE. We sometimes want to take a break from the daily craziness in the house and at work too. But we know, this is not realistically doable everyday, and we wouldn't want it everyday too because life then gets boring. That's why I said, we just want this sometimes... not all the time. 3. REST. Aahhh, we do want to SLEEP yes, make that UNINTERRUPTED SLEEP my loves. Moms are physically tired from all the work she does in the office or at home. Moms are often mentally tired on life hacking and how to stretch the household budget for two weeks. She also has to do meal planning, baon planning, grocery planning and all the strategic planning for the family. She's the first person to wake up in the morning, especially on school days, she cooks breakfast, does the laundry, prepares for work, is a career woman the whole day or a business woman or a work-at-home mom or a stay-at-home mom and she's busy taking care of all the elements in her life, of her kids, of her husband and of her household. She sometimes wish she has more time to do more things, but it's impossible. She sometimes wish she has two bodies so she could accomplish more the whole day but of course that can't be or else her husband might be too happy! And when she comes home, she goes straight to cooking or fixing the rooms or hanging the washed clothes or playing with the kids then at night play with ze husband too. If she has a baby or a toddler who still wakes up several times in the middle of the night to ask for milk or get up to pee, she wakes up too. The things we do for love. These many things are tiring but we do them because we love our families. But if you only have an idea what goes on inside a mom's mind and body, then you'd also clamor for MORE SLEEPING TIME. 4. LOVE. You know the moment when we became moms, the "I" became "WE" and "ME" became "US." We completely lost ourselves to the craziness of motherhood, and everything that came with it. Most of the time, we forget ourselves and all we think about is our families. We even beat ourselves to guilt, when we take time out to enjoy the company of others or even when we take a short "ME-TIME." But we have to be reminded that it's OKAY to LOVE ourselves, in fact, we SHOULD love ourselves otherwise, we couldn't give what we don't have inside. But here's the good news, YOU could also fill our LOVE TANK and even if it spills all over the place, we don't mind, not at all! We need to feel loved by you in any manner you show or tell it, we'll know, because you're the loves of our lives. You can show love by SAYING it, by HUGGING or KISSING, by being thoughtful, sweet, by asking us how we are at the end of the day, by simply being interested with what we're saying, by not hurting us, by singing or dancing for or with us, by making us laugh with your jokes or funny stories, by remembering to call or text or by giving us a loving compliment. Whatever you do to show your LOVE, we appreciate it. YOU make us moms happy, say I LOVE YOU to us, we'd feel like we've won a jackpot. Actually it's priceless. It's that simple. 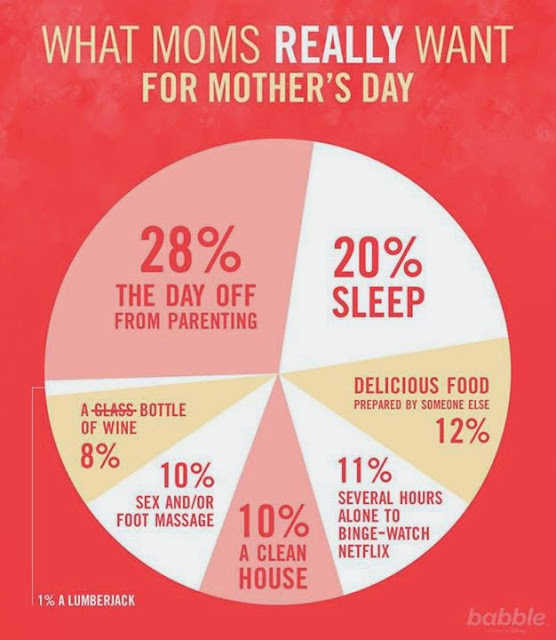 These are the four things MOMS really really need and want not only for Mother's Day but for all the days of our lives. But then again we're MOMs, and moms always have a lot of things to do everyday, so just surprise us with simple things. We don't demand for grand things, but those would be nice! So to all mothers reading this, HAPPY MOTHER'S DAY to us! May we get all the appreciation, peace, rest and LOVE that we need, not only on Mother's Day but all the days of the year!